This husky safari holiday gives you a genuine sense of adventure on the snow. While a short session of dog sledding is enough to leave you completely thrilled, a three-day experience like this has you forming deeper connections with both the huskies and the amazing landscape around you. Staying in wilderness cabins is very different to more conventional holiday accommodation and really makes you feel like you’re part of another way of life. My home is Northern Lapland with its amazing beautiful nature, friendly people and rich culture. Together with my genuine partners from Inari & Utsjoki we want to introduce to you the authentic Lapland, the land of myths and legends, Sámi culture, the Northern Lights in winter, the Midnight Sun and white nights in summer and the pristine nature all around. Let us share the best of Northern Lapland with You! 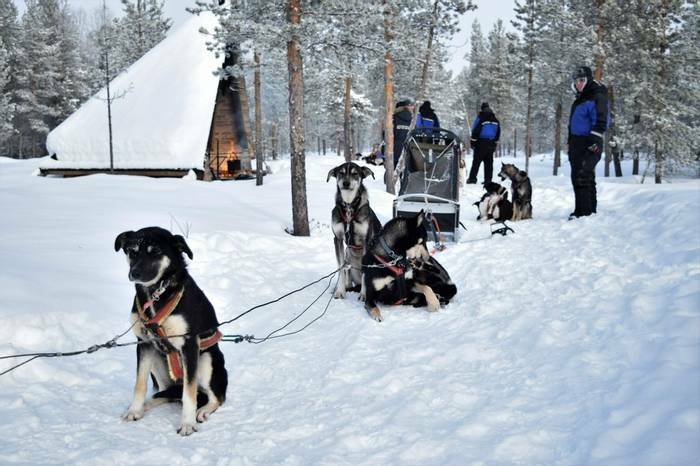 Spend three days powering through the Finnish wilderness in Ivalo on your very own dog sled. Admire the wintery surroundings and bond with your loyal team of dogs during this incredible experience where you’ll also spend two nights in a wilderness cabin, living like a real Nordic adventurer. Husky safaris are the ultimate ‘must-try’ activity for anyone visiting the Nordic Countries and feature in many of our trip itineraries. This holiday takes things to the next level, letting you experience three days of dog sledding through pristine wilderness environments, much like professional mushers do on a regular basis. You will take responsibility for your very own sled and a pack of around four to five huskies. As you look after and feed these marvellous animals, you will form a close bond with them. Making your way together through the outdoors, you will cover around 50 kilometres on the first and third day, and around 30 kilometres on the second day. The frozen waters and islands of Lake Inari will provide a spectacular backdrop for your dog sledding journeys. The first and last nights of this four-night holiday will be spent at Hotel Ivalo. During the two nights of the husky safari, you will stay in a wilderness cabin run by the dedicated Guesthouse Husky team. Leave everyday comforts behind and try your hand at some rather different skills, like collecting water from a frozen lake and heating up a traditional sauna. While the facilities will be simple, the experience will be extraordinary. Having landed at Ivalo Airport, you will be collected and transferred to Hotel Ivalo. Meet the rest of the group over dinner in the restaurant and get a good night’s sleep in preparation for tomorrow. Following breakfast, the adventure begins. 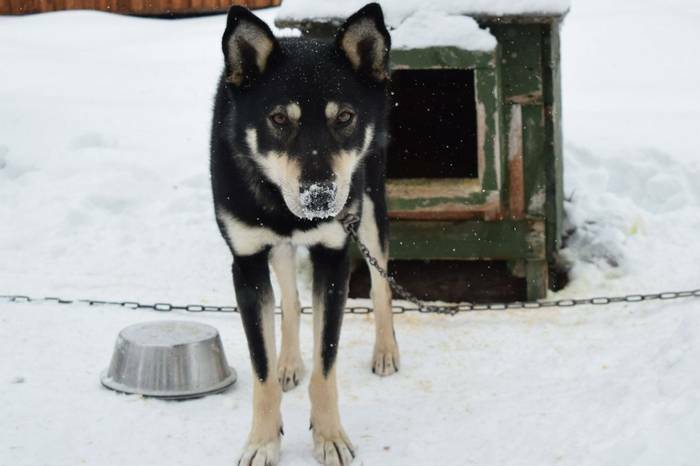 You will be taken to the Guesthouse Husky Alaskan sled dog farm and receive warm winter clothing. After packing equipment and provisions for your journey, you will be given a safety talk and shown how to handle a dogsled. It will then be time to greet the enthusiastic huskies and harness them up. Each person will have their own sled and pack of four to five huskies and will be responsible for taking care of their dogs. Setting off behind your guide, you will cover a range of winter terrain, taking in the stunning Finnish landscapes and developing your mushing skills. Lunch will be had around an open fire, where you can share your new experiences with the rest of the team. Heading off after lunch, you will cover more trails before reaching your wilderness cabin accommodation. You will have travelled around 50 kilometres through the wilderness. Once you have seen to the needs of your huskies and fed them, you can help collect water for the sauna and assist with cooking. As would be the case with any group of wilderness explorers, it is expected that you do so, as this ensures everyone can get refreshed and fed quickly and efficiently. You can then settle down for the night in a comfy sleeping bag, but be sure to keep an eye out for the Northern Lights before you go inside, because you will be in an area which is free from light pollution! On Day 3, you will spend the day exploring around frozen Lake Inari and its islands with your huskies, covering around 30 kilometres before returning to the wilderness cabin. Once again, breakfast, outdoor lunch and dinner are included. Finishing breakfast and tidying up the cabin, you will pack your equipment into your sled and travel off with your huskies on the final safari. Making your way back, you will stop for lunch along the way, reaching the husky farm in the afternoon after covering around 50 kilometres. After waving goodbye to your furry companions, you will be transferred to Hotel Ivalo, where you can make the most of the sauna, swimming pool, and jacuzzi. Dinner will be had in the restaurant. After breakfast at Hotel Ivalo, you will be transferred to Ivalo Airport for your journey home. Hotel Ivalo is a traditional Finnish hotel in the small town of Ivalo serving classic local cuisine. The hotel's location offers guests easy access to the shops and activities as well as wonderfully scenic views of the nearby river. Through the windows of the spacious hotel restaurant, you can admire the views of the river. Here you will enjoy a buffet breakfast with a range of options. Evening meals showcase a variety of traditional cuisine and you can try dishes such as whitefish and reindeer. The hotel also has a wellness area for guests. This includes an indoor heated swimming pool, three saunas which are heated in the evening for your use, a mini-winter spa with three wooden Jacuzzis and a ‘chill’ room with an open fireplace. Double/Twin Rooms: The hotel has 94 guest bedrooms in total which are decorated in a traditional Finnish style. All guest bedrooms are en-suite with shower room, a TV and a hairdryer. 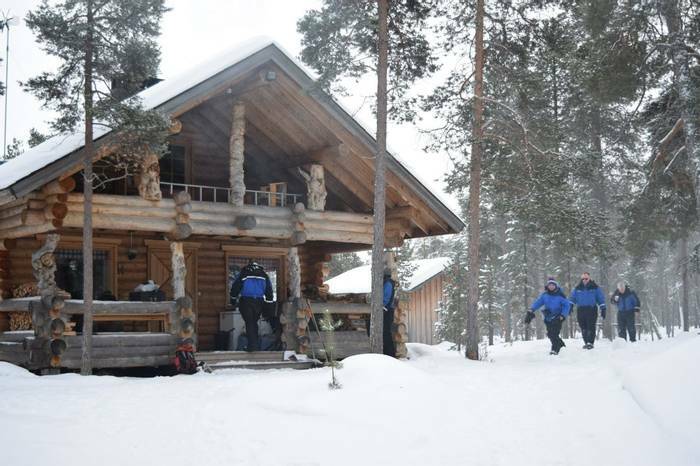 Based on an island in the Lake Inari area, the Guesthouse Husky wilderness cabin will be your accommodation during your overnight husky safaris. Like all wilderness cabins, it has simple facilities but is a warm and welcoming place to stay. It is also situated in an area of low light pollution, increasing your chances of spotting the Northern Lights. While staying here, you will be expected to help out with day-to-day activities like feeding the huskies, collecting water from the lake, and heating the on-site sauna. This gives you a true sense of Finnish-style wilderness living. Cosy sleeping bags are provided during your stay. Why not extend your trip for a few extra nights at Hotel Ivalo and book some additional activities that you simply can't leave Lapland without trying? Alternatively, you can just spend a few more days unwinding after your adventures and make the most of the hotel’s marvellous swimming pool and Jacuzzi. Price based on two people sharing a double room on a half-board basis. Please ask our Travel Experts for more information or a tailored quotation based upon your holiday. Read more peacefulness, the clarity of the stars, the expanse of sky and the scenery. Photographs, videos and words cannot do any part of the trip justice. We were extremely lucky and saw the Northern Lights on both nights in the wilderness. Our guide, Samili was perfect for us and looked after and supported us all. As for the dogs, well what can you say, they are beautiful and very loyal and hard working. Each of us in the group would have no hesitation in recommending this trip to everyone to add to their bucket list. It was very hard work, but perfect and worth every single ache we came away with. A huge part of my work role is customer support and I have to say that we really cannot fault any aspect of the trip. That includes the support from all at Artisan and partners right from my first enquiry over a year before departure, to after arriving home and the support trying to locate the item which was removed from my suitcase at Ivalo.